In celebration of National Volunteer Week, we would like to introduce you to another one of our volunteers, James “Jim” Snowden. 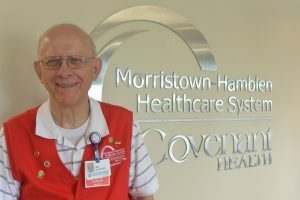 Jim has been volunteering for Morristown-Hamblen Healthcare System over six years. His wife, Shirley, is also a volunteer and has been at MHHS over 15 years. Jim is the current President of the MHHS Volunteer Auxiliary Board. His favorite part about volunteering is meeting and working with people as well as being able to help them. Before he was a volunteer at MHHS, Jim worked at Wallace Hardware for 18 years and before that at American Enka for 41 years. You can find Jim volunteering in Admissions on Tuesdays and Thursdays in the hospital. He also helps proctor the tests for medical students as needed. Jim loves to travel with his wife, Shirley. They have been married for 65 years. Jim has been to every state in the US and all the provinces in Canada apart from one. He is very involved in his church, First United Methodist Church Morristown. He is a Sunday School teacher, on the finance committee, and is a lay delegate for the Holston Annual Conference. We hope you enjoyed getting to know Jim Snowden and stay tuned for the next Volunteer Appreciation Week spotlight. If you are interested in exploring the possibilities of being a volunteer, please visit www.morristownhamblen.com/volunteers.